This historian named Hawley stated the fundamental skills of the Medicine people in around 1920. The saying "We all know our futures", may be true. If it is known to us the knowledge is in the unconscious mind. 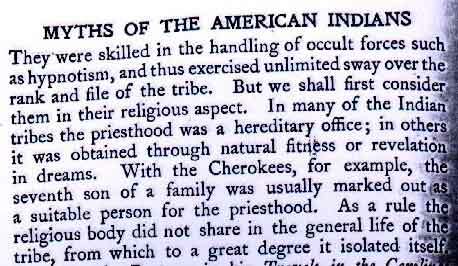 In the day this book was written it was unlikely it could have been published if it was not titled, "Myths of the American Indians". The reason that the "religious body" , the Medicine men "did not share in the general life of the tribe" was to make more effective the disassociation of memory that is inferred in the pages of the book, "Emotions and Memory". It is clear that we do not no as much today about these people as we did at the beginning of the 19th century.